"Howard...painted in the broadest strokes imaginable. A mass of glimmering black for the menace, an ice-blue cascade for the hero, between them a swath of crimson for battle, passion, blood." David Gemmell cheated death, or at least a hope-denying misdiagnosis, back in 1984 when he wrote his first and most beloved sword-and-sorcery novel Legend. At its most powerful the subgenre Gemmell did so much to perpetuate has always had something inside, something to do with death, and now death has once again done something to sword-and-sorcery. This morning Gemmell died, at the unacceptably young age of 57. 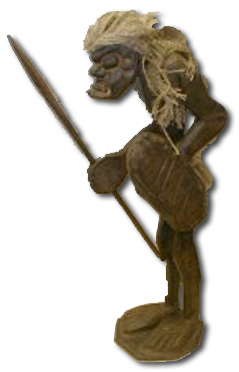 What should have been a time of celebration for heroic fantasy, with the Howard Centennial and the immensely gratifying return of Charles R. Saunders and his outcast/champion Imaro of Nyumbani, must now also be a time of mournful and (if there is any justice) never-ending remembrance. The latest sign that Howard’s centennial year marks a critical watershed for the author is the news that a poor reading copy (!?!) of A Gent from Bear Creek (Jenkins, 1937) has just sold on eBay for a “Buy It Now!” price of $8500 (hat tip: Damon Sasser). Cimmerian readers will recall that a mere four years ago I purchased a much better copy of this book for $3700 ($4000 once the currency exchange was figured in), at a time when there were less known copies of the book than there are now. Granted, $8500 isn’t first edition Dracula numbers yet, but it’s a huge jump in four years, even as more copies of the book have been discovered. And don’t forget, this copy of the book was in terrible condition. What does this say about the Howard Museum copy, which I thought was in pretty bad condition at the time, but which now looks to be under-insured at $10,000? And my God, what does this say about Glenn Lord’s pristine copy, the only one in the world with the dustjacket intact (although other dustjackets exist in English library archives), and one that is signed “August Derleth’s copy,” giving it that extra bit of cachet? Would Glenn’s book fetch Dracula numbers? Interesting questions all, and their sum total indicates a sign of Howardian permanence the likes of which we have never seen. In the past, Howard’s reputation has risen and fell with the vagaries of the market and the waxing and waning interest in fantasy. Like so many other authors, he was a big fish in a small pond, a niche guy. Perhaps it’s a little too early to claim victory over this long-time state of affairs, but I don’t think so. The last few years have seen huge jumps in collector’s prices, tons of Howard roaring into print, new Howard magazines thriving, and perhaps most importantly more Big Media news coverage than ever before. Both the Cross Plains fire and Howard Days hit CNN and USA Today, and Pulitzer-Prize winning book columnist Michael Dirda gave Howard a birthday tribute in the Washington Post. 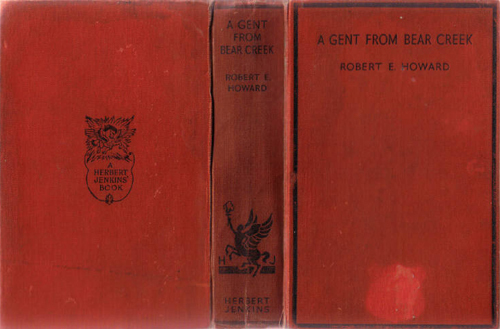 And now, with the centennial closing and fans preparing for the 2006 World Fantasy Convention — where Howard is the theme of this year’s festivities — we have a poor copy of a Howard book selling for eight g’s and change. It’s becoming more clear every day that Howard has burst through an invisible ceiling of some sort, and catapulted himself into a stratospheric orbit that isn’t likely to fail anytime soon. He’s becoming more mainstream, more acceptable to mix in polite society. A century on, he’s also benefiting from the strange effect that age has on things, making them seem more important and authoritative simply by virtue of their distance from our time. How lucky that Howard wrote in such a way that his work remains modern and accessible even as the passing of time grants him classic status. It’s somewhat of a relief to realize that we can begin relaxing a bit and start solidifying other aspects of Howard’s legacy without ceaselessly worrying about keeping a sputtering engine churning over the next hill. He’s flying now, low to the ground perhaps, but flying steadily and serenely nonetheless. And I for one am enjoying the view. Lending slip on the verso of the rear cover. How the hell is anyone supposed to blog in this weather? Don’t know what it’s like in your neck of the woods, but here in LA the heat has been unprecedented — my God, Al Gore was right! One hundred degrees each day, which is bad enough, but the usual soothing ocean breezes that waft through apartments and car windows have failed, too, leaving even strong gusts dry and hot as hell. Unless you have AC — and many people in LA don’t, because you usually never need it — you are screwed. I can only imagine what the good people of Queens and St. Louis are going through. Meanwhile, the July ish of The Cimmerian is still being put together with less than a week left in the month, and Howard fan Al Lane — who many of you met in Cross Plains at this year’s Howard Days — is in town and staying at Fortress Grin. For the last month Al has been on an ambitious vacation, driving solo from San Antonio westward and staying in campgrounds, each day visiting a plethora of museums, national parks, and events like ComiCon. Over the last few weeks he’s been to Nevada, Oregon, Northern California, and San Diego, and now he’s in the City of Angels, looking to have the kind of fun us pulp fans enjoy. Today was spent traipsing around Hollywood looking for various stars on the Hollywood Walk of Fame, ones specifically dear to a fan’s heart — Gene Roddenberry, Boris Karloff, Ray Bradbury, Ray Harryhausen, etc. We also hit some of the best movie book and memorabilia stores in the world, where after many years of looking Al was able to score some stills from sundry episodes of The Twilight Zone he’s always wanted. 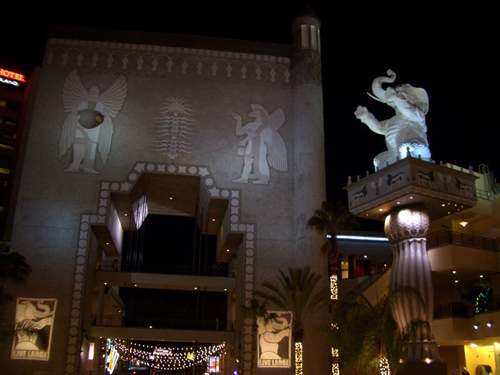 Made a pit stop at the Kodak Theater, site of the Academy Awards, where Al was suitably impressed by the gargantuan Babylon decor, stone elephants atop massive pedestals decorated with glyphs. 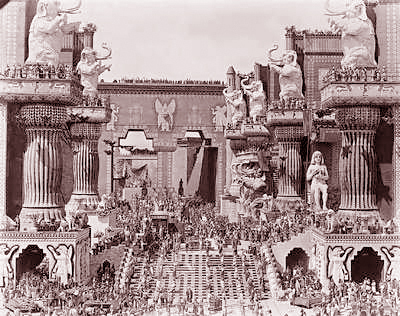 Those of course are from the classic D. W. Griffith film Intolerance (1916), but I like to think of them as “The Towers of the Elephant.” You understand. After our Hollywood jaunt, we headed over to the home of Rah Hoffman and Donald Sidney-Fryer for hours of pulp talk and book signing. Those two — eighty-five and seventy-two years old respectively — are fountains of knowledge, and have thousands of stories to tell about the old days. Al was thrilled to hear Rah talk of Charles Hornig — editor of The Fantasy Fan and a correspondent of REH’s — coming over to Rah’s house in the ’40s, picking up one of his old copies of Weird Tales, and inhaling deeply of what he thought was the Sweetest Scent in the world — rotting pulps! 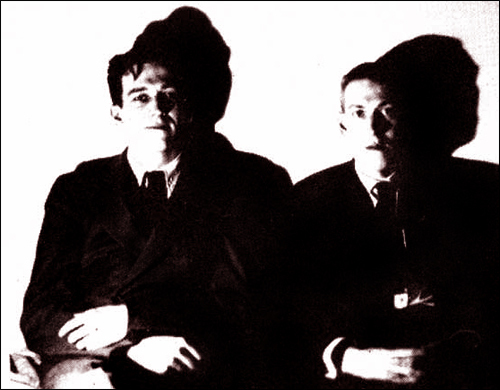 Rah also told us of his friendship with Robert Barlow, and how he once bought Barlow’s copy of Ebony and Crystal by Clark Ashton Smith for $5. He showed us photographs of his visit to Smith in 1941, the first of several, where he rode from LA to San Francisco in the trunk of a car with none other than Emil Petaja, another corespondent of Howard’s. Emil was the guy who Howard sent his poem “Cimmeria” to, the copy with the now-famous inscription detailing its genesis. He also wrote a wonderful poem dedicated to Howard at his death that was reprinted decades later in Glenn Lord’s The Howard Collector. Rah even showed us the picture CAS took of Rah, perhaps the only known photo composed and shot by Smith himself. Al was most bowled over by Rah’s amazing Hannes Bok painting hanging over his fireplace, an original commissioned by Rah, with Rah giving Hannes the basic gist of the types of characters he wanted represented — a green naked demon lady, a strange bat-like creature — and Hannes taking it from there. All of this neglects the hundreds of other stories and artifacts which Al saw this night, plus he got all of his Smith books signed by DSF. So even with the heat boiling our blood and frying our brains, the dog days of summer haven’t been a total bust. Tomorrow it’s another day of sightseeing with Al, checking out the La Brea tarpits, the Petersen Automotive Museum, the Natural History Museum, and — as a special treat — I’m taking him to the grave of one of his movie idols, the late great Bela Lugosi. Wednesday Al heads back to Texas, while I knuckle down and get the July issue finished. And hopefully at long last this heat wave will break, once again making it possible to think about blogging. As I rush to finish the July issue of The Cimmerian in time to call it a “July Issue,” I find myself not only remembering the stellar first half of the centennial, but also looking forward to the rest of the year. 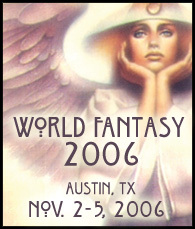 The cornerstone of the next six months will be the World Fantasy Convention in early November. It’s being held in Austin this year, a scant two and a half hours from Cross Plains, and Howard has been chosen as the theme of the convention. If you missed the January birthday bash and the June Howard Days spectacular, perhaps you can make this last Howardian blowout of the year. In addition to panels about REH, the show will feature Glenn Lord and Howard artist Gary Gianni, as well as the debut of [redacted]’s new biography Blood and Thunder: The Life and Art of Robert E. Howard. Howard fans scheduled to attend include Finn, Rusty Burke, Steven Tompkins, and Darrell Schweitzer among others. Lots to see and do, lots of friends to meet, lots of Howard to discuss and appreciate. As this is a professional con, you will also get to meet many of the authors and editors you have been admiring for years. And hey, if you’ve never been to Cross Plains or Howard Days, here’s your chance to take the bus tour and kill two birds with one vacation. If you are planning to go and want to carpool or share a room, your best bet is to post on the major Howard email lists: Dennis McHaney’s REH Inner Circle and Terry Allen’s REH Comics Group. Room rates at the Renaissance Hotel (where the con is being held) are fairly steep, even at the convention rate, so if price is an issue search around for one of the many hotels close by — rates at those places can run up to half as cheap. Doubtless more will be added as time goes on. One problem with Project Gutenberg over Wikipedia is that the general reader can’t easily edit the text as they find typos and errors. Still, it is a valuable resource for when you need to search a text for scholarly purposes, or when your trusty book collection isn’t handy. The June 22 number of the Review has just hit Californian shores, and contains a glowing article on Howard Days by Project Pride correspondent Arlene Stephenson. Cimmerian readers well remember Arlene’s article “The Fire That Spread Around the World” for V3n2 (February 2006), which contained a host of harrowing and uplifting stories from the Cross Plains Fire that didn’t make the front page of the CNN website, or for that matter any of the usual Howardian venues. Here she gives a flavorful small-town spin on the centennial proceedings that accurately captures the mood of the event. How does one measure the success of an event? By the number of people in attendance? By the number of volunteers involved in making it happen? By the variety of programs and activities offered? By the geographic scope of states and communities represented? By the comments of those in attendance? By any of these standards, the recent Robert E. Howard Centennial Days were an outstanding success. Scholars and fans came to Cross Plains to experience a few hours or a few days with other folks having the same interest in one of the greatest pulp fiction writers ever to put words on paper. From the first guest to arrive from Washington D.C. to the last guest from Eastland, a steady stream of visitors filed through the local library and the Howard House Museum. In that body of visitors, one could hear conversations in Swedish and German; exchanges with British and Canadian accents and even the accents from the Carolinas and Maryland were interesting to our Texas ears. Number wise, some interesting facts came to light. The registration book at the Museum showed that 240 people had registered from 22 states, Washington D.C. and the four countries mentioned above. The Library hosted one panel discussion that drew way beyond a “standing room only” crowd. Librarian Cherry Shults and Board Member James Warlick were extremely impressed with the patience and tolerance of the group as they just kept squeezing closer and closer together to learn what they could about working with Howard manuscripts. And the scholarly crowd was just as impressed with the collection of Howard’s works housed in the library. Several of the authors in the group donated a variety of new materials to the library. One such donation was about 35 books from the collection of Sprague de Camp. Although most of these are in other languages, they will be invaluable for research as scholars compare Sprague’s work with the more authenticated interpretations of Howard’s writings. At the Howard House Museum, the gift shop was overflowing with publications of dozens of writers and illustrators featuring Howard’s poetry, boxing stories, Texas humor, artwork, and of course the better-known Conan stories. Project Pride volunteers were kept busy making sales and keeping the shelves stocked. The constant flow of visitors through the Museum kept another group of volunteers welcoming guests and giving guided tours. And yet other volunteers kept the ice water and refreshments flowing at the hospitality center in the pavilion. The Library and Project Pride agree that the Howard Days are definitely the most interesting projects that they sponsor. Each year more and more resources are donated to the library, and thus, more and more out-of-town visitors come to utilize these resources. The reputation of Project Pride and their efforts in maintaining Howard’s home and perpetuating his influence in the world of creative writing just keeps spreading in an ever-widening circle around the world. Both of the local groups extend a heartfelt message of appreciation to all the volunteers who helped make the weekend so successful and to the community for making all our visitors feel so welcome. You can find them over at the REHupa Website. Please update your records.